Is there a single "best" facial oil? Not exactly—but not all oils are created equal. We’ll explain which you should avoid, why you should consider adding one to your routine, and share five well-researched oils that should be at the top of your skincare shopping list. How Do Oils Benefit Skin? Whether applied as a pure oil, a blend of oils, or included in a moisturiser, oils function primarily as skin revitalising emollients, which means they have a smoothing, softening effect on skin. Oils are particularly beneficial for those with dry, dehydrated skin because they can quickly make these skin issues feel immediately better. These nourishing types of oils are also gentle enough for very dry, sensitive skin, even eczema-prone skin. There are many oils to consider for use on skin, but research has shown the most beneficial type of oils are non-fragrant. Fragrant aromatic oils, also known as "essential oils," contain volatile compounds that can aggravate skin, which never adds up to great skincare! Take a look at our Cosmetic Ingredient Dictionary for details on specific, commonly used fragrant oils such as lavender, rose, and eucalyptus and you’ll get a better of what we mean. All of these smell great, but what pleases your nose won’t make your skin happy. Good news: Some of the most beneficial plant oils for skin are of the non-fragrant variety. These types of oils are a rich source of antioxidants and replenish fatty acids that dry, dehydrated skin absolutely needs to look and feel healthier. The following five non-fragrant plant oils are a few of our favourites here at Paula’s Choice Skincare. There are lots more to consider but these do deserve some special attention. We chose the oils below based on their variety of benefits. 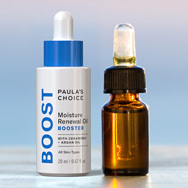 You can find each oil sold separately, or, better yet, blended into one easy-to-use product such as the approach we took with our Moisture Renewal Oil Booster. Borage seed oil is worth considering because of its strong soothing and skin renewing properties. It is a rich source of an important fatty acid known as gamma linolenic acid. More to love, borage seed oil works with ceramides in skin to leave it more hydrated, smooth imparting a radiant glow. Jojoba seed oil is a favourite because its composition closely matches that of our skin’s oil (also known as sebum). Jojoba oil is a good source of smoothing triglycerides, a mix of hydrating fatty acids, and antioxidants. Applied to skin, jojoba oil is able to attract moisture without the traditional greasy feel many oils have. Safflower seed oil has a lot in common with borage seed oil in that both have soothing, nourishing properties. But safflower oil has a different mix of fatty acids than borage seed oil, including linoleic acid, a beneficial omega-6 fatty acid. Even better, its linoleic acid content has been shown to help minimise the chance of getting clogged pores. Apricot kernel oil earns high marks from because it contains skin-loving sterols. Cholesterol is an example of a sterol ingredient, and it naturally occurs in healthy skin. Apricot kernel oil is also a great source of antioxidant vitamin E along with the calming fatty acid, oleic acid. Cranberry seed oil rounds out our list due to its skin-replenishing benefits when applied to skin. It’s also a good source of omegas: You get omegas 3, 6, and 9 from this oil, along with a potent mix of antioxidants. Although not found in many products, this oil is worth seeking out! You can opt to apply a single oil to skin, but because different plant oils have different mixes of antioxidants, fatty acids, and other important substances, we feel strongly about applying a blend of oils for maximum results. As part of your skincare routine, you can apply the oil alone, to cleansed skin or add a few drops of oil to your facial moisturiser, serum or body moisturiser—depending on where you want to apply it. Having an oil blend on hand for use when needed means you don’t have to shop for an all-new facial or body moisturiser when your favourite isn’t quite enough for those times when skin needs more moisture or smoothness, no matter your skin type or concern. As you’ve seen, oils can be powerful allies in your skincare arsenal. Whether used daily or simply when needed, a single oil or blend of them (again, the latter is preferred) can be a lifesaver that leads to smooth, radiant skin from head to toe! Aburjai T, Natseh FM. Plant used in cosmetics. Phytother Res. 2003;17:987. Arquette DJ, Bailyn EM, Palenske J, et. al. Non-comedogenic and hypoallergenic properties of jojoba oil and hydrogenated jojoba oil. J Cosm Sci. 1998;49:377. Hartop PJ, Prottey C. Changes in transepidermal water loss and the composition of epidermal lecithin after application of pure fatty acid triglycerides to skin of essential fatty acid-deficient rats. Br J Dermatol. 1976;95:255. Letawe C, Boone M, Pierard GE. Digital image analysis of the effect of topically applied linoleic acid on acne microcomedones. Clin Exp Dermatol. 1998;23(2):56-8. Rudzinska M, Gornas P, Raczyk M, et. al. Sterols and squalene in apricot kernel oils: the variety as a key factor. Nat Prod Res. 2016;8:1-5. Turan S, Topcu A, Karabulut I, et. al. Fatty acid, triacylglycerol, phytosterol, and tocopherol variations in kernel oil of Malatya apricots from Turkey. J Agric Food Chem. 2007;55(26):10787-94.